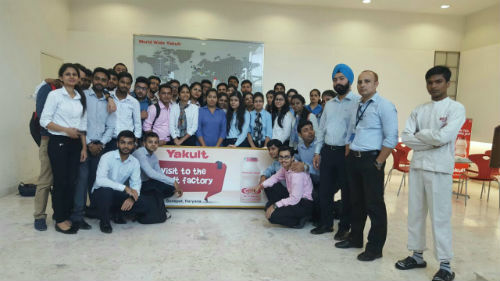 Industrial Visit to Yakult Danone India Pvt. Ltd.
Topic : Industrial Visit to Yakult Danone India Pvt. Ltd. for students of PGDM 1st Semester. Date of event : August 9, 2016 Tuesday. The main aim of the industrial visit was to make students aware about the various practices of the company in terms of its production, distribution channels, quality management, human resources etc. Event Report in brief: The visit began with a very whelming welcome from the officials of Yakult Danone India Pvt. Ltd. They firstly took the students to their Conference Room and served them with some refreshments, then they gave the presentation about their company and they also told some great facts about the bacteria that are being used in Yakult Drink. Yakult Danone India Pvt. Ltd. is a joint venture between two global probiotic leaders and it was formed in the year 2005 to manufacture and sell probiotic products in Indian market. Yakult, a probiotic drink was launched in India in 2007, and is presently available in Delhi, NCR, Chandigarh, Punjab, Jaipur, Mumbai, Pune and Banglore. After the presentation, they divided the students into two groups and took them for the factory tour and explained them in detail about the production process. At the end, they gave some time to the students for the query session and served them with a Yakult drink and also asked them to fill a feedback form and gave them some brochures of the company. Overall, it was a learning experience for the students and they enjoyed it whole-heartedly.